Can they make a better black box pinger? I wrote earlier on how we might make it easier to find a lost jet and this included the proposal that the pingers in the black boxes follow a schedule of slowing down their pings to make their batteries last much longer. Read more about Can they make a better black box pinger? Southwest recently announced a very different approach to providing in-flight entertainment. Partnering with dish network they will offer live TV and on-demand programming over the in-plane WIFI to people's personal devices. Sadly, for now, it's just Apple devices. I will presume they will extend this to other platforms, including laptops, soon, and they should consider also allowing you to rent a tablet one-way if you don't have your own. Just returned from an overseas trip to Moscow, I am reminded of the rant I posted earlier about the constant interruptions on the in-flight entertainment system. A new paper on trusted traveler programs from RAND Corp goes into some detailed math analysis of various approaches to a trusted traveler program. In such a program, you pre-screen some people, and those who pass go into a trusted line where they receive a lesser security check. The resources saved in the lesser check are applied to give all other passengers a better security check. This was the eventual goal of the failed CLEAR card -- though while it operated it just got you to the front of the line, it didn't reduce your security check. The analysis shows that with a "spherical horse" there are situations where the TT program could reduce the number of terrorists making it through security with some weapon, though it concludes the benefit is often minor, and sometimes negative. I say spherical horse because they have to idealize the security checks in their model, just declaring that an approach has an X% chance of catching a weapon, and that this chance increases when you spend more money and decreases when you spend less, though it has diminishing returns since you can't get better than 100% no matter what you spend. The authors know this assumption is risky. Turns out there is a form of security check which does match this model, which is random intense checking. There the percentage of weapons caught is pretty closely tied with the frequency of the random check. The TTs would just get a lower probability of random check. However, very few people seem to be proposing this model. The real approaches you see involve things like the TTs not having to take their shoes off, or somehow bypassing or reducing one of the specific elements of the security process compared to the public. I believe these approaches negate the positive results in the Rand study. This is important because while the paper puts a focus on whether TT programs can get better security for the same dollar, the reality is I think a big motive for the TT approach is not more security, but placation of the wealthy and the frequent flyer. We all hate security and the TSA, and the airlines want to give better service and even the TSA wants to be hated a bit less. When a grandmother or 10 year old girl gets a security pat down, it is politically bad, even though it is the right security procedure. Letting important passengers get a less intrusive search has value to the airlines and the powerful, and not doing intrusive searches that seem stupid to the public has political value to the TSA as well. We already have such a program, and it's not just the bypass of the nudatrons (X ray scanners) that has been won by members of congress and airline pilots. It's called private air travel. People with their own planes can board without security at all for them or their guests. They could fly their planes into buildings if they wished, though most are not as big as the airliners from 9/11. Fortunately, the chance that the captains of industry who fly these planes would do this is tiny, so they fly without the TSA. The bypass for pilots seems to make a lot of sense at first blush -- why search a pilot for a weapon she might use to take control of the plane? The reality is that giving a pass to the pilots means the bad guy's problem changes from getting a weapon through the X-ray to creating fake pilot ID. It seems the latter might actually be easier than the former. I have written before about letting passengers pay for an empty middle seat next to them and recently about ANZ's cuddle class and related programs which partially implement this. While I believe airlines could sell the empty middle for somewhere in the range of 30-40% of a regular ticket, this still has issues. In particular, are they really going to bump a poor standby passenger who had a cancelled flight and make them stay another night so that people can get a more comfortable seat? One idea is to allow the sale of empty middles by dutch auction. In effect this would say, "If there are going to be empty middles on this plane, those who bid the most will get to sit next to them." If this can be done, it's a goldmine of extra revenue for the airline. What they sell costs them nothing -- they are just selling the distribution of passengers on the plane. If the plane fills up, however, they sell it all and nobody is charged. The dutch auction approach would let each passenger make an offer. If there are 5 empty middles, then the 10 people who sit next to them win, but they all pay the 10th highest bid price. If only 9 passengers bid, the 10th highest price is zero, and everybody pays zero -- which is what happens today, except it's semi-random. While this may seem like a loss for the airline, many game theory tests suggest that dutch auctions often bring the best result, as they make both sides happy, and people bid more, knowing they will actually pay the fair price if they win. There is one huge problem to solve: How do you arrange that matched bidders are sitting together to share the empty middle? Each empty middle benefits two passengers. 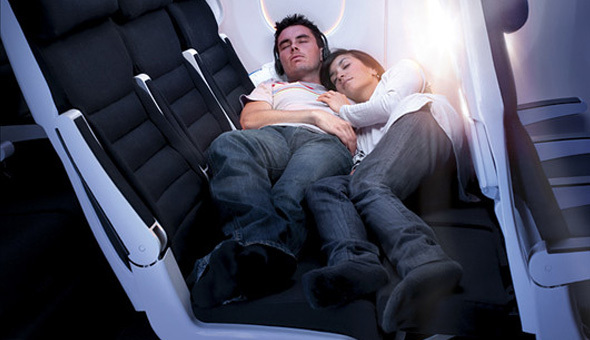 Air New Zealand "Cuddle Class"
Some years ago I made the proposal that airlines sell half of a middle seat at half price or less so that two coach passengers could assure they would have an empty middle next to them. Read more about Air New Zealand "Cuddle Class"
Like just about everybody, I hate the way travel through airports has become. Airports get slower and bigger and more expensive, and for short-haul flights you can easily spend more time on the ground at airports than you do in the air. Security rules are a large part of the cause, but not all of it. In this completely rewritten essay, I outline the design on a super-cheap airport with very few buildings, based on a fleet of proto-robocars. I call them proto models because these are cars we know how to build today, which navigate on prepared courses on pavement, in controlled situations and without civilian cars to worry about. In this robocar airport, which I describe first in a narrative and then in detail, there are no terminal buildings or gates. Each plane just parks on the tarmac and robotic stairs and ramps move up and dock to all its doors. (Catering trucks, fuel trucks and luggage robots also arrive.) The passengers arrive in a perfect boarding order in robocars that dock at the ramps/steps to let them get on the plane through every entrance. Luggage is handled by different robots, and is checked and picked up not in carousels and check-in desks, but at curbs, parking lots, rental car centers and airport hotels. The change is so dramatic that (even with security issues) people could arrive at airports for flights under 20 minutes before take-off, and get out even faster. Checked luggage would add time, but not much. I also believe you could build a high capacity airport for a tiny fraction of the cost of today's modern multi-billion dollar edifices. I believe the overall experience would also be more pleasant and more productive for all. This essay is a long one, but I am interested in feedback. What will work here, and what won't? Would you love to fly through this airport or hate it? This is an airport designed not to give you a glorious building in which to wait but to get you through it without waiting most of the time. The airport gets even better when real robocars, that can drive on the streets to the airport, come on the scene. Give me your feedback on The Robocar Airport. Here's an idea that seems a bit wild and scary at first, but it's doable today and has broad benefits: Small aircraft that don't have landing gear, but instead land and take off from robotic "can't miss" platforms pulled by cables on short airfields. UPDATE: Some updated ideas and a link to a funded research project looking at similar ideas. For every small aircraft purchaser, a big decision is whether to get retractable landing gear. They are very expensive, and create a risk of failure, but your plane will fly a lot faster and be more fuel efficient if you get them. What if we could leave the landing gear on the ground? Imagine a wheeled platform on the runway with robotic control and a variety of systems to perfectly track an approaching aircraft. Pulled by cables, it can accelerate at several "g"s forward and back and left and right. As the aircraft approaches it tracks it and the cockpit display indicates positive lock. If the plane veers left, it veers left. If the plane speeds up it speeds up. Pretty much no matter what the pilot or winds do (other than missing the runway entirely) the plane can't miss landing on it. It's spring loaded so even if the landing is a bit hard the shock is cushioned. Done right, it's just like having fancy shock absorbing landing gear. Just back from some time on the road, which always prompts me to think of ways to improve travel. First, and most simply: Every hotel room comes with a small foldable stand on which to put your suitcase. The problem is they all come with exactly one of these. In some rooms there is space on the tables or dresser for another bag, but often there is not. Doing solo business travel I have just one bag, but all couples, and many solo wanderers have more than one, and so you end up putting bags on the floor. It's quite annoying, since these stands can hardly be very expensive -- folding cloth and metal chairs can be had for $10 in most stores. I've only tried once or twice to ask housekeeping for another, and been surprised to learn they don't keep spares. Frankly, I think it would be cheaper to just put 2 in every room than waste staff time delivering extras, but either would work. And the hotel often knows if a room is booked for 2 rather than one in advance. If you have a bellman take up your bags, not only does the bellman see how many bags you have but it's a sure thing you have several. Every bell station should have some extra racks and throw what is needed on the luggage cart. Next, I think it would be interesting to see car rental companies develop cars just for road trips. They are the largest buyers of cars (and often owned by car companies) so custom cars are not out of the question. SUVs and some minivans contain many of the features of a road trip car, but they are often 3 times as expensive when reserved in advance, and 1.5x to 2x more expensive in gasoline usage. What features might a road trip car have? Everybody knows about the Jet Blue attendant who flew off the handle when he got hit in the head by a bag and had fights with passengers over stored carry-ons. And we know airlines are starting to charge higher fees for checked bags (and even carry-ons) which netted them over $700 million last year. This pushes more people to want to use carry-on bags, which we already wanted to save time, and that means more waits at security and more waits getting on and off flights. Add to this a system of official gate-check racks. These racks would be there at the gate or in the jetway. If need be they would be mounted in a special elevator or forklift so that they can be quickly and reasonably gently inserted and removed in the cargo hold. 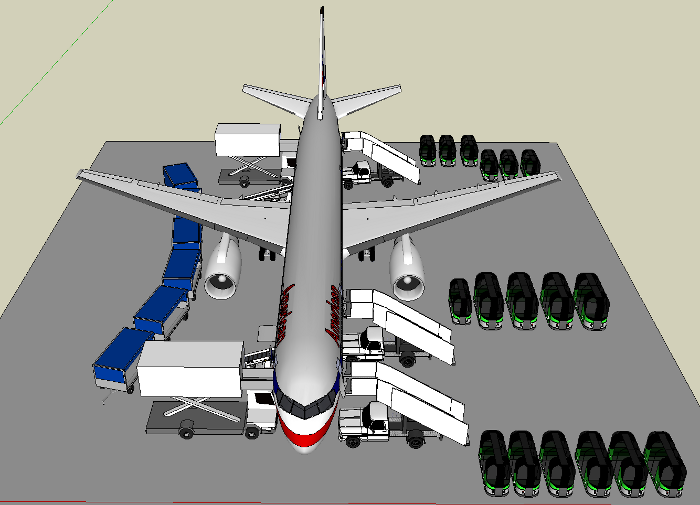 These racks would include some rails for standardized bags (especially on puddle-jumper planes which can't have as many overhead rails) and some amorphous sections with strong cargo netting. They would have shock absorbers to reduce shocks when they are put on the plane or taken out. You would place your items in these racks yourself -- in parallel with other passengers, in a wide space where doing so is not blocking others -- and the goal would be that you could put semi-fragile items, including things like cameras and laptops into the racks with full confidence. To help with this, we could have a camera on the wing which feeds the seatback screens so that passengers could watch this module as it is loaded and unloaded. This would do a lot to ensure that it is treated with care in a way that checked luggage often is not. Last week, on my trip to Berlin, I managed to drop my passport. I don't know where -- it might have been in the bathroom of Brussels airport trying to change clothes in a tiny room after a long red-eye, or it might have been when Brussels Air made me gate check a bag requiring a big rearrangement of items, or somewhere else. But two days later, arriving at a Pension in Berlin I discovered it was missing, and a lot of calling around revealed nobody had turned it in. In today's document hungry world this can be a major calamity. I actually have a pretty pleasant story to report, though there were indeed lots of hassles. But it turned out I had prepared for this moment in a number of ways, and you may want to do the same. The upshot was that I applied for a passport on Wednesday, got it on Thursday, flew on Friday and again on Monday and got my permanent passport that same Monday -- remarkable efficiency for a ministry with a reputation for long bureaucracy. After concluding it was lost, I called the Canadian Embassy in Berlin. Once you declare the passport lost, it is immediately canceled, even if you find it again, so you want to be sure that it's gone. The Embassy was just a couple of U-bahn stops away, so I ventured there. I keep all my documents in my computer, and the security guy was shocked I had brought it. He put all that gear in a locker, and even confiscated my phone -- more on that later. Since I'm on the road (Washington DC right now, then Berlin on Monday for a few days and then Toronto for the weekend of the 11th) I will lament on the problem I have noted before in travel power. We have to carry so many chargers. I have also found it's a pain to take them all out and put them back in again. The civil disputes could be kept to a minimum by making the jobs short and a good deal for the guests, since for the homeowners, the guest room was typically doing nothing anyway -- thus the success of couch surfing -- and making slightly more food is no big deal. But the other legal risks would probably make it illegal for a company to get in the middle of all this. At least in the company's home country. A company based in some small nation might not be subject to remote laws. I love online check-in, and printing your boarding pass at home to avoid doing anything but going to the gate at the airport. Airlines are even starting to do something I asked for many years ago and sending a boarding pass to the cell phone that can be held up to a screen for check-in. But if they can't do that, I want them to let me to print my boarding pass long before my flight. In particular, to print my return boarding pass when I print my outgoing one. That's because I have a printer at home but often don't have one on the road. One of the world's favourite (and sometimes least favourite) topics is the issue of terrorism and security. On one side, there are those who feel the risk of terrorism justifies significant sacrifices of money, convenience and civil rights to provide enough security to counter it. That side includes both those who honestly come by that opinion, and those who simply want more security and feel terrorism is the excuse to use to get it. Much of what is done in the name of security doesn't actually enhance it, it just gives the appearance of doing so, and the appearance of security is what the public actually craves. This has been called "Security Theatre" by Bruce Schneier, who is a friend and advisor to the E.F.F. We often "fight the previous war," securing against the tactics of the most recent attack. The terrorists have already moved on to planning something else. They did planes, then trains, then subways, then buses, then nightclubs. Terrorists will attack where the target is weakest. Securing something just makes them attack something else. This has indeed been the case many times. Since everything can't be secured, most of our efforts are futile and expensive. If we do manage to secure everything they will attack the crowded lines at security. Terrorists are not out to kill random people they don't know. Rather, that is their tool to reach their real goal: sowing terror (for political, religious or personal goals.) When we react with fear -- particularly public fear -- to their actions, this is what they want, and indeed what they plan to achieve. Many of our reactions to them are just what they planned to happen. Profiling and identity checks seem smart at first, but careful analysis shows that they just give a more free pass to anybody the terrorists can recruit whose name is not yet on a list, making their job easier. The hard reality is, that frightening as terrorism is, in the grand scheme we are for more likely to face harm and death from other factors that we spend much less of our resources fighting. We could save far more people applying our resources in other ways. This is spelled out fairly well in this blog post. Now Bruce's blog, which I link to above, is a good resource for material on the don't-panic viewpoint, and in fact he is sometimes consulted by the TSA and I suspect they read his blog, and even understand it. So why do we get such inane security efforts? Why are we willing to ruin ourselves, and make air travel such a burden, and strip ourselves of civil rights? There is a mistake that both sides make, I think. The goal of counter-terrorism is not to stop the terrorists from attacking and killing people, not directly. The goal of counter-terrorism is to stop the terrorists from scaring people. Of course, killing people is frightening, so it is no wonder we conflate the two approaches. I recently went to the DLD conference in Germany, briefly to Davos during the World Economic Forum and then drove around the Alps for a few days, including a visit to an old friend in Grenoble. I have some panoramic galleries of the Alps in Winter up already. Each trip brings some new observations and notes. For the first time, I got a rental car which had a USB port in it, as I've been wanting for years. The USB port was really part of the radio, and if you plugged a USB stick in, it would play the music on it, but for me its main use was a handy charging port without the need for a 12v adapter. As I've said before, let's see this all the time, and let's put them in a few places -- up on the dashboard ledge to power a GPS, and for front and rear seats, and even the trunk. And have a plug so the computer can access the devices, or even data about the car. The huge network of tunnels in the alpine countries continues to amaze me, considering the staggering cost. Sadly, some seem to simply bypass towns that are pretty. I've had good luck on winter travel, but this trip reminded me why there are no crowds. The weather can curse you, and especially curse your photography, though the snow-covered landscapes are wonderful when you do get sun. Three trips to Lake Constance/Bodenzee now, and never any good weather! Davos was a trip. While there was a lot of security, it was far easier than say, flying in the USA. I was surprised how many people I knew at Davos. I was able to get a hotel in a village about 20 minutes away.